Welcome to another post about the GroLab™ Automation of the Day video series. These videos take you on a guided tour of all the GroLab™ functionalities. If you want to see all the published episodes, check our YouTube channel or keep following our blog. In this fourth episode, we demonstrate how easy it is to add more power outlets to a growing area, extending the number of devices you can control and automate with the GroLab™ grow controller. Due to the efforts of our engineers, you can seamlessly add extra modules to your growing area without any effort or configuration what so ever from your side. After all, GroNode the system’s core unit supports up to 16 modules, 4 of each type (PowerBot, TankBot, SoilBot and UserBot! After installing the new module in your growing area and connecting the desired devices/sensors to it, GroNode automatically detects the module being visible and ready to configure in the GroLab™ Software. At this point, you can start using the devices and any sensors the new module have, the way you want! PowerBot is a power supplier module with environmental control capabilities that provides four controlled outlets that you can use with any device you want. 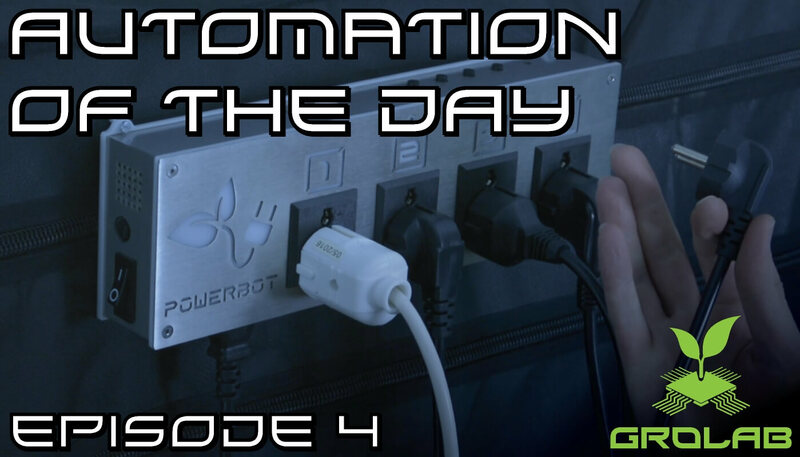 In this fourth episode of the GroLab™ Automation of the Day video series, we showed how to install an extra PowerBot. This module does not only extends the number of outlets at your service but also offers a temperature/humidity sensor. You can use each outlet for any purpose, like controlling the ventilation, irrigation or automatically regulate the humidity/temperature. It is fully up to you which devices you want to connect to the PowerBot. Note: A new version of PowerBot launched on September 2018, offering even more capabilities, like flood detection, support for two universal inputs (water level sensors, motion/smoke detectors…) and for the upcoming CO2 combined sensor. Is it possible to use same module configurations? Thanks to the module import/export configurations feature it is extremely easy to replicate the same configurations to the new GroLab™ modules that you install. This is extremely useful if you want to extend your production just by replicating your currently growtent/growroom. The import/export module configurations tool is accessible from the modules section in the GroLab™ Software. This tool allows you to export/import all the module configurations, like device’s name, power consumption, type and even the cooldown time, the same for the sensors. To export configurations you just the need to select the desired module, click to export settings, set the file name and select the folder where you want to store it. On the other hand, to import setting you need to select the desired module, click to import settings and choose the file with the configurations you previous stored, simple as that! GroLab™ supports up to four different growing areas with two grows each, this allows you to use the devices connected to the PowerBot in different areas/grows. For example, to control four lamps with different light schedules for four distinct growing areas. In the GroLab™ Automation of the Day video series, we used the first PowerBot to control the light, climate, and irrigation. With this newly added PowerBot, we’ll have the means to implement a second hydroponic Ebb and Flood grow, as you’ll be able to see in the next episode of this series.